Born: 24 May 1875, Delhi, India. Died: 4 August 1920, Cape Town, South Africa. Claude G. Davies (later Finch-Davies) was the third child of Major-General Sir William Davies and his wife, Lady Elizabeth B. Field. His interest in natural history as a youth was probably inspired by his mother and though he received his school education in England he painted many Indian birds, presumably during holidays in India. In 1892, while in London, he enrolled as a private soldier with the Cape Mounted Rifles and arrived at King William's Town for training in June the next year. During the next four years he served at various stations in eastern Pondoland. In 1897 he visited England with members of his regiment in connection with Queen Victoria's diamond jubilee. Later that year he was posted to Matatiele in East Griqualand and in April 1898 was promoted to corporal. By that year, and perhaps earlier, he was making notes about the birds he encountered. Many of these were hunted for the pot, for example, he found the Hadedah Ibis, Greywinged Francolin and Yellowbilled Duck to be excellent eating. It seems that no sketches from this period have survived, as his earliest known painting of an African bird dates from 1903. During the Anglo-Boer War (1899-1902) he was on active service all over southern Africa and was awarded several medals, but had little time for bird studies. After the war, in April 1903, he was promoted to sergeant. For the next five years he was stationed at various places in Pondoland, followed by a period spent along the Mtamvuna River - forming the border between Pondoland and Natal - from 1908 to 1910. He then returned to Matatiele, where he remained until 1914. During this period the Cape Mounted Rifles was incorporated into the defence force of the Union of South Africa as the First Regiment, South African Mounted Rifles. Davies not only collected birds to sketch or paint, but also preserved the skins. Many of his specimens were sold or presented to the Transvaal Museum and the British Museum (Natural History). Other specimens were kept as pets. His paintings improved rapidly and from about 1905 were of consistently high quality and accuracy, showing the birds in exquisite detail and remarkably life-like, usually perched against a lightly pencilled background to suggest their habitat. Each painting was accompanied by notes on the species, based on his own observations and other available sources. He made contact with other bird enthusiasts, including Frank A.O. Pym*, curator of the Public Museum at King William's Town, Professor James E. Duerden* of Grahamstown, and Alwin K. Haagner* of the Transvaal Museum, who became a life-long friend. He was also in contact with and borrowed specimens and literature from the Albany Museum, Port Elizabeth Museum, Natal Museum, Durban Museum, and National Museum of Rhodesia (now Zimbabwe). Despite his isolated position he became a member of the South African Ornithologists' Union (in 1907), the British Ornithologists' Union (in 1908), and the Avicultural Society (in 1909). His first paper, "Notes on birds observed and collected in the districts of Port St Johns, Lusikisiki, Flagstaff, and Bizana, Pondoland...", appeared in the Journal of the South African Ornithologists' Union (1907, Vol. 3(2), pp. 180-205). It was followed by "Some notes on the wildfowl and waterbirds of Matatiele, East Griqualand" in the same journal (1908, Vol. 4(2), pp. 102-106) and by several more papers and notes up to 1915. His first published painting, depicting a new race of the Olive Sunbird and named Cinnyris olivaceus daviesi in his honour by Haagner, was published in 1908 to illustrate Haagner's description of the race. 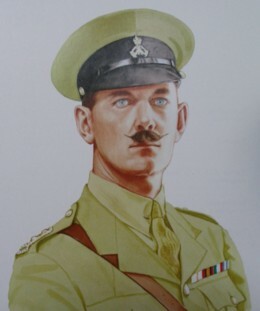 At the outbreak of World War I in August 1914 Davies and his regiment were sent to the west coast to take part in the campaign in German South West Africa (now Namibia). In April 1915 he was promoted to lieutenant and by July that year the territory had been occupied. After a visit to Cape Town for medical treatment he was stationed at Otjiwarongo early in 1916, where he continued his work on birds. On 4 August 1916 he married Aileen S. Finch in Cape Town and changed their surname to Finch-Davies. They eventually had three children. During the next two years Finch-Davies took part in a campaign in Ovamboland and was stationed, among others, at Tsumeb, Otjiwarongo, and finally Windhoek. He sent specimens to the Transvaal Museum and corresponded intermittently with Austin Roberts* there, but their relationship was strained. In 1918 he published a major paper, "On birds collected and observed in the districts of Okanjande and Outjo, S.W. African Protectorate", in the fist issue of the South African Journal of Natural History, followed by additions and corrections two years later. In October that year he spent a month's leave at Walvis Bay where he studied and collected many coastal birds and made one of the first southern African recoveries of a tern ringed in Europe. Towards the end of 1918 Finch-Davies was posted to Pretoria, where he began writing up his notes on raptors. He published two papers in The Ibis, "Some notes on Hieraa�tus ayresi..." (1919) and "Notes on South African Accipitres" (1920). The latter paper, published in two parts and extending over 49 pages, included notes on the biology and behaviour of the South African raptors and was the first comprehensive and accurate paper on the southern African species of this group. A most unfortunate development in Finch-Davies's life took place in 1920. During one of his visits to the Transvaal Museum he was caught by the police while tearing plates from reference books. Investigations revealed that over 200 plates had been removed from 90 volumes. Formal charges against him were dropped, but he was required to pay the museum �380 in damages, in monthly installments. His collection of 29 sketch-books and illustrations, totalling about 1000 paintings, was handed over to the museum as security. He received a severe reprimand from the military and in May 1920 was posted to Cape Town. There he died unexpectedly from a heart attack a few months later. His wife was left destitute and returned to her parents in Ireland with the children. She presented her husband's thirtieth and final sketchbook to the British Museum (Natural History) in 1923. The bulk of the paintings remained in the possession of the Transvaal Museum, but for copyright reasons could not be published for 50 years. After this period had elapsed the following volumes of his paintings were published, with biographical information and additional text by Dr Alan Kemp of the Transvaal Museum: The biography of Claude Gibney Finch-Davies, 1875-1920 (1976); The birds of prey of southern Africa (1980, 140 plates); The birds of southern Africa (1982, 176 plates); The bird paintings of C.G. Finch-Davies (1984, 99 plates); The gamebirds and waterfowl of southern Africa (1986, 68 plates), based on Finch-Davies's original paintings for Horsbrugh's book of the same title in 1912, its paintings unusual in that they all have coloured backgrounds; and A celebration of birds (1990) with 21 plates completed between March 1918 and April 1920, each accompanied by a page of hand-written notes. Together these volumes constitute a memorial to the leading pioneer of bird illustration and study in southern Africa. The bird paintings of C.G. Finch-Davies. Johannesburg: Winchester Press, 1984. A celebration of birds: C.G. Finch-Davies's final album of southern African birds. Johannesburg: Natural History Books, 1990. Finch-Davies, C.G. & Kemp, A. The birds of prey of southern Africa. Johannesburg: Winchester Press, 1980. Finch-Davies, C.G. & Kemp, A. The birds of southern Africa. Johannesburg: Winchester Press, 1982. Gamebirds and waterfowl of southern Africa: a collection of 68 water-colours by C.G. Finch-Davies.... Johannesburg: Winchester Press, 1986. Journal of the South African Ornithologists' Union, 1907-1914, Vol. 3-10. Kemp, A.C. The biography of Claude Gibney Finch-Davies, 1875-1920. Pretoria: Transvaal Museum, 1976. Obituary: Lieut. Claude O. [sic] Finch-Davies. South African Journal of Natural History, 1920, Vol. 2(2), pp. 292-293.